This post is inspired by the WordPress Weekly Photo Challenge. The theme is Peaceful. My little grandson sleeps peacefully with not a care in the world. His only needs are love, food, warmth, clean nappies, “winding” and sleep – how simple life is when you are a baby! As I watch over him, his basic needs fulfilled, he is so happy and content. He is adorable. As adults are we driven by materialistic ideals as we strive for more – and once we have more, are we truly happy? And why does nearly every toy these days need a battery? Batteries are SO expensive to buy! Is it necessary to surround babies with so much electronic noise? I sigh as I remember all the simple toys such as building blocks, jack in a box, and plastic cups my children grew up with; it did not take much to make them happy then, so why is it so different now? A battery operated toy was a luxury not the norm. This crazy cacophony of electronic noise is enough to drive me to distraction and I can reach for the off switch! Poor baby. If there are several of these toys shouting for attention all at once, is this healthy? Maybe I am old-fashioned, but aren’t babies entitled to peace too? So as I reflect on the word “peaceful” and in the name of sanity I am tempted to start a “PEACEFUL TOY” revolution! If you are a parent, baby or grandparent, aunt, great cousin (three times removed) or even a demented observer – am I just grumpy, or are children’s toys today destroying the “sound” ozone layer of our daily lives? I agree with you, PiP. I think we are constantly being more and more desensitized due to all the “stuff” we are bombarded with. Everyone seems to be addicted to some kind of electronic or battery-operated device. Just look around you in any airport, mall, even many restaurants. There is a television or some kind of loud music blaring in the background. People are staring at the tiny screen of their IPod or Blackberry, usually instead of actually communicating with another live person. Maybe the addiction is starting earlier and earlier, now by indoctrinating babies! I agree. I wonder sometimes if we have progressed too far? I watched some guys on the plane this morning. they had ipods pugged into their ears playing music. Even I could hear it! I am adicted to my PC, but not any other electronic device. In fact, I enjoy peace and quiet! You’re not alone PiP! I think it wouldn’t be a bad idea to have some sort of law in place whereby children aren’t allowed near technology for at least a few years. Let them come to terms with the world before sticking a flashing gadget in their faces! I had LEGO bricks when I was a kid, and plastic dinosaurs, Action Men and Playmobile stuff. I didn’t need batteries to have adventures, I just made up my own noises for all my toys! When I see kids playing today they’re all silent, staring at a screen, not speaking a single word to each other. I remember playing with friends and we’d all be making raarrrr noises, beeps, wooshing sounds and all manner of crazy vocals to bring our toys to life. I love technology now although I simply can’t see the attraction with Angry Birds. However, I guess all the pretty colours are a big draw for kids these days, and sadly some parents are only too happy to have their children play quietly. Shame. But yeah, batteries cost a fortune! I used to love building lego houses and cars with our kids. We also used to do crafts. Hopefully, I taught them how to use their imagination and be creative. I wonder how children will develop in terms of practical creativity in today’s world. Kids used to build camps in the garden and you are right. made all sorts of noises as they pretended to be different characters. Grandma is still noisey as she ressurects all the old nursery rhymes. The battery business must be making a fortune! PiP, I am with you 100% – the simple things seem so far away now – and it’s the simple things that usually make us the happiest! There are too many electronic toys now for kids – all driven by batteries, and too much noise; I refuse to buy them anymore. 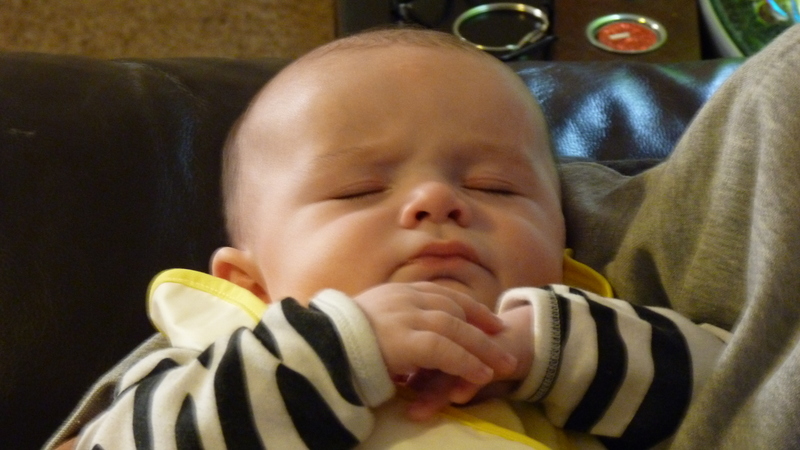 No, you are not grumpy – and you are right, babies need peace too! I think babies can become overstimulated. I love it when they create their won noise by banging things together! I was amazed at the number of electronic toys. Still at least grandma does not need batteries – only a acup of tea! He does look peaceful as he sleeps. 🙂 He certainly inspired me . Sorry, I forgot to say how peaceful your grandson looks – gorgeous photo! That is a face of peace and contentment if I ever saw one! Beautiful photo . . . and thoughts, PiP. Get your grandkids OLD FASHIONED toys ~ building blocks, lego sets, balls, jump ropes, stacking cups, etc. No Batteries Required. Our other grandchild has stacking cups and blogs and she loves them! Simple is often best to stimulate children’s imagination! When I was raising my first two, over 30 years ago, noisy toys (drums etc) were BANNED!!! I believe babies NEED quiet time, so I am with you all the way! Aww Robyn, how can you ban drums? LOL 🙂 They are a great way for children to express themseslves and relieve tension….just joking. It’s the poor electonic sounds that great on my nerves. What a gorgeous pic! He’s so beautiful. Methinks you make beautiful grandchildren! Why thank you Lindsay….but then I’m biased! I don’t get why toys have to make all that noise. And I don’t think it’ll do the kids any good either. Maybe that’s where they all get ADHD from nowadays? I know exactly how you feel. We do seem to be bombarded with noise wherever we go. Even nature programmes on the TV have to be accompanied by music. Children don’t seem to be allowed to use their imagination these days. There are even books with sounds now. It is lovely to hear the sound of children playing – as long as it is the children and not some electronic game. Hi MC I am gulity of buying noisy books 😦 Old Mc Donalds and If you’re Happy and you know it, clap your hands LOL 🙂 I think my little granddaughter is going to be musical. Just watched a little video of her shaking her head and banging her hands in time with some music. there has to be a balance re elcetronic toys…it’s just finding it! The companies who make batteries must be laughing all the way to the bank! PiP, I am with you…down with the noise! Peace, peace, peace! LOL unfortunately, I think the “noise revolution” is here to stay! You do know that this toys have an OFF button right? LOL! I don`t think its just modern parenting, its modern society. Computers, mobile phones electronic gadgets have all become the norm. Yep, the on off button is the next “trick” I must teach them. I wonder if children brought up with modern technolgy will ever use the creative part of their brains? Will books be replaced by kindles in schools? I wonder what they would say if we could ask them? Nope you’re not being grumpy, you’re speaking for most of us., I absolutely agree with you about the batteries, prices and the noise. I wonder if the noisy electronic chaos is harmful to babies and children. I wonder if it might be a factor in some of the attention-disorders. I adore our little grandbabes…can’t wait to be back in France! I am not a parent, but I agree with you. Simpler toys = a growing imagination. What a gorgeous baby….makes me just want to pick him up and hug him…too precious. He is gorgeous and such a good little baby! I only got toys on Christmas and my birthday. So I am astonished at what loot kids receive today. Give a kid a box or a if it’s a baby, sit them up in the table where they can see everything. Give them those gerber hard cookies -what a mess. Kids love ’em. Our little granddaughter is fascinated by labels! I don’t find your views old fashioned at all. A lot of the toys are the market nowadays are unnecessary tat!! But as a mum of four, the youngest being 5yo, I can also see a lot of value in good quality play ideas. ( A lot of which are not toys). I think it’s good, particularly for young children, to have a wide spanning variety. (That doesn’t necessarily mean a lot of toys). But I think around age 2 to 5 it’s good to have something musical (can be home made), something to provoke the imagination, something encouraging construction, items for creativity, somethings for motor skills, and I’m a big fan of books, puzzles and games. Learning is fun and little ones are like a sponge. Some toys are truly brilliant but I also put huge value on nature walks, feeding the ducks, cutting up junk mail with a pair of little scissors and possibly gluing them on other bits of junk mail, street chalk, a drawn out shopping list where she has find the items as we go around the supermarket, paper and crayons, baking, cooking together (the littlest loves helping to make homemade pasta, for instance), playing I spy, trying to use chopsticks, the list goes on and on. Wow, you have so much fun ahead with your little grandchildren!! Some great ideas! I think when you look in these big toy stores it’s sometimes difficult as you are spoilt for choice. I fell into the “battery” trap this year. So I am guilty! I love playing with babies and children, you are right – they are like sponges! such promise on the little face and tiny fingers. Precious. As much as I adore electronic toys (mostly of the interactive pet or robot variety), I agree. Children really need to experience the joys of creating and learning through play and a lot of the electronic toys just don’t stimulate this kind of thing in the way building blocks, musical instruments, clay and art materials will. Meccano was my favourite toy!